In an attempt to underline the safety of their food products, more than 40 companies are touting their goods at a Japanese food exhibition in Hong Kong this weekend. 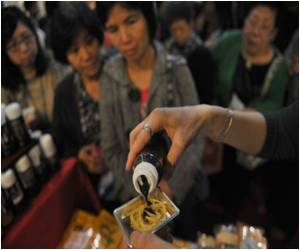 Hong Kong is the biggest foreign market for Japanese food, and exporters ranging from sake brewers to rice merchants are represented at the three-day exhibition, which opened Friday at the city's convention centre. Japanese official Mototaka Nishimura said the event would help overcome doubts about the safety of Japanese produce after last year's meltdown at the Fukushima nuclear plant. "As recovery of exports of Japanese food is our pressing issue, we decided to carry out this exhibition in Hong Kong, the largest destination of exports of Japanese food," he said. "I'd like people overseas to know that Japanese food for export is safe. Only food which passed the Japanese government's safety guideline is allowed to be put on the market." The Fukushima accident, triggered by the devastating March 11 quake-tsunami, sent poisonous radioactive particles into the air and water, blanketing crops grown near the power station and polluting waters where seafood is harvested. A number of Fukushima products were taken off shelves, with government bans on beef, milk, mushrooms and some green vegetables. Even so, many Japanese consumers continue to have doubts about official safety standards. Exports of Japanese farm products -- once a favourite of the country's Asian neighbours who prized their safety and quality -- fell 7.4 percent in 2011 from the previous year while exports of marine products dropped 10.9 percent. Eight countries including China and South Korea are still blocking the import of several vegetables produced in parts of northern and eastern Japan. Japanese agriculture minister Michihiko Kano will visit the exhibition on Saturday before meeting Hong Kong's chief secretary for administration.